Global Action Nepal (GAN) is a development organization working since 1996 for access and quality education "Putting Children at the Centre". 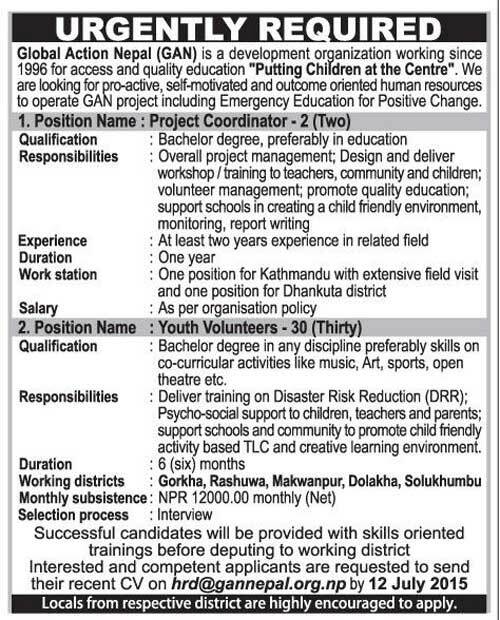 We are looking for pro-active, self-motivated and outcome oriented human resources to operate GAN project including Emergency Education for Positive Change. Qualification : Bachelor degree in any discipline preferably skills on co-curricular activities like music, Art, sports, open theatre etc.